When you live in Alpharetta, you can never count on the weather. Folks near metro Atlanta may enjoy sunny, 75 degree days in late January and tornado warnings in February. Your home may undergo unexpected ice storms one day and torrential downpours the next. But the one thing you can count on is Mr. Junk storm clean up. 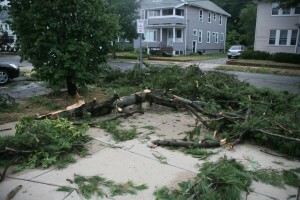 Whether you have downed branches littering the yard or broken furniture strewn across the porch, Mr. Junk is here to clean up your yard and home after a storm. Has the windy weather strewn shingles across the playset in the backyard? Did your renovation project break up and scatter across the pool? Don’t spend hours doing backbreaking clean up of organic debris. Call Mr. Junk to remove the mess so you can get started on home restoration. We’ll stay to pick up every stray twig, giving you the satisfaction of a home and yard that’s up to your pre-storm standards. Want to be proactive against the next late winter storm? Prevent a disaster by trimming back dangerous branches and removing hazardous furniture. Call Mr. Junk to haul away rotted tree limbs, unwieldy branches, and old furniture before they crash into the kitchen window. Keeping debris off of you property is the best way to prevent accidents in the future. Mr. Junk offers complete storm clean up and disaster restoration services in Alpharetta. Call to schedule your preemptive cleanup or storm debris removal today.